Let’s face it: WordPress is king when it comes to website content management, powering more websites than any other web platform available today. WordPress achieved such widespread use because of its price and its power. The price is FREE, which is hard to beat. The power is massive, as WordPress has been designed to be flexible enough to build just about any type of website one can imagine. But there is one small catch. To take full advantage of that power you need a powerful theme. That’s where the investment of time and money comes in. There are plenty of simple and free themes available, however, so even this is not a serious drawback. It is unlikely that you’ll find a perfect WordPress theme to accomplish all that you want for free, but there are a large number of theme developers who offer powerful premium themes at very reasonable prices. Still, however, many of those awesome themes will fall short of your needs. The problem is that you may not come to realize the shortcomings until after you’ve bought several premium themes. I’ve been involved in website design for nearly 20 years, and have been using WordPress for the past several of those years. In that time I’ve tried out more WordPress themes than I can count. Some have been great; some not so much. Still — until today — I haven’t found a single theme that does everything that my clients or I need. But today I have found an incredibly versatile theme that just may be the one that does it all. It is called OmniPress, and that is an apt name. It could be called omnipotent — all powerful. That is saying a lot. But this thing does a lot. 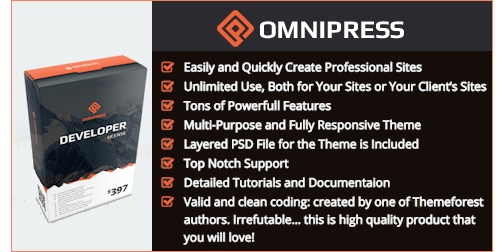 OmniPress is more than a WordPress theme. This is virtually a WordPress theme builder, facilitating the building of custom WordPress websites. Check out the OmniPress sales page to see more for yourself. I think you’ll be impressed, as I have been. But one note of caution: please do not be put off by the sales presentation script. It was written by the developers of this software, not by professional copy writers. And as you’ll probably sense right off, English is not their first language. They are computer programmers, after all, not English scholars. I’ve known some English scholars in my day, and let me assure you, I’ve never met one who could begin to write good software. That said, please give this presentation your full attention. Then make the small investment to try it out for yourself. Your satisfaction is guaranteed, or you get your money back. That means a lot, because you don’t get such a guarantee from other premium WordPress theme developers. With most themes you buy, even if it does not perform to your expectations, you get what you got, and that’s it. 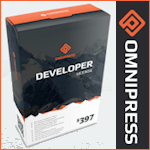 The developers of OmniPress are so certain you’ll be happy with their product, they offer a full money back guarantee. If you are not impressed enough to keep it, just let them know within 30 days and get your investment back. This is a zero risk proposition you really should not miss. If you postpone your purchase, however, you’ll miss the introductory pricing, so act today.Oh, and a word about price. Yes, this one is pricey at $397, but worth it. However, don’t let that scare you off. During the first few days of product launch you can save as much as $350 from that price. That is like an 88% discount if you take action quickly. Seriously, decent premium WordPress themes generally sell in the $47 price range. But no other theme at that price has all of the features you’ll find in OmniPress. Buy OmniPress today for just $57.00. If you postpone your purchase, however, that price may be higher. If you haven’t already bought it, you have already missed out on the early bird launch price, which was just $47. The current price will be in effect for a short time, and then the price will go up again. So to get the best price, buy it today, before the price goes up. Oh, one more thing. There is a $37.00 optional upsell you may want to take advantage of. This small added investment gives you 30 very attractive pre-designed templates to help you get rolling quickly. Pick one you think best fits your project and simply edit Latin placeholder text content to deliver your message in English (or any other language you prefer). If you don’t bite on this offer, you’ll be offered 15 done-for-you templates for $27.00. Frankly, the $37 option is the better deal, and highly recommended. Having this collection of done-for-you templates will expedite getting your website online, as all you need to do is edit the demo content to suit your needs.